MÜNSTER, S. - Typus Orbis Universalis. Typus Orbis Universalis. 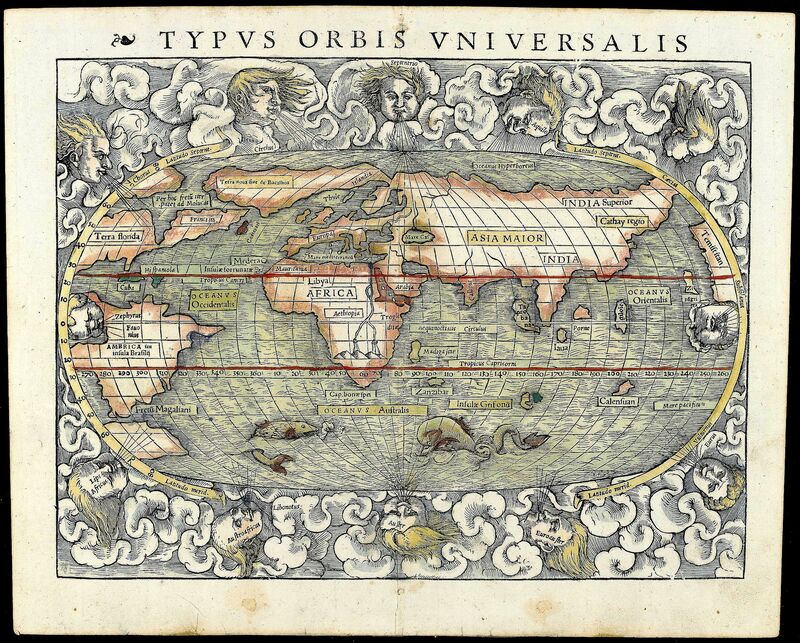 - MÜNSTER, S.
Title : Typus Orbis Universalis.. Size : 11.0 x 13.8 inches. / 28.0 x 35.0 cm. Description :Uncommon first issue (east and West windheads within oval perimeter) in preciously rare original color (recto and verso). “The world as viewed in the mind of educated mid-16th century Europeans is perhaps best preserved in Munster’s classic map”. Paul Cohen. Best known for being the first map to name the pacific Ocean “Mare Pacificum”, Munster follows Verrazano with the pacific cutting deeply into North america from the north, leaving only a narrow isthmus on the East coast at 40 degrees north latitude. Verranzano believed, as he gazed over the outer banks of North Carolina, that he was looking at the sea which would lead to the coast of China. Japan, derived from Marco Polo, is shown misplaced to the Southeast and shaped arbitrarily. Africa, accurate in outline, shows two lakes in the ‘Mountains of the Moon” as the source of the Nile. Greenland, hovering above Canada, stretches into Europe into Asia. Condition : Woodcut. Mint condition.